Fluidic Energy is a commercial-scale, zinc-air battery firm. Although the firm has raised more than $150 million in funding from strategic, venture and government sources, it has managed to keep a relatively low profile. That is, until now -- with recent news of the firm's memorandum of understanding in partnership with Caterpillar and PT Perusahaan Listrik Negara, Indonesia's state-owned electric utility. Normally, we would apply Mehta's law to any MOU and discount the news. But Fluidic is in production and has shipped 50,000 of its battery cells, a total of more than 10 megawatts of battery storage for deployments in developing nations as a replacement for diesel generators or lead-acid batteries. Fluidic CEO Steve Scharnhorst admits that an "MOU is just a right to have a discussion," but notes that the company is moving fast and is already in the middle of contract negotiation. The agreement is meant to furnish reliable and renewable energy to 500 remote villages throughout Indonesia using PV solar combined with more than 250 megawatt-hours of Fluidic battery capacity. The Caterpillar connection provides an existing, robust business in power generation for mining and remote sites, as well as a global sales and distribution network. Scharnhorst told GTM that Fluidic's technology was a spinout from Arizona State University that was "really improved by smart guys like [founder] Cody Friesen and [CTO Ramkumar] Krishnan." In principle, these zinc-air cells have potential for high energy density, high cycles, and low weight. The CEO said that the battery has "free oxygen" as the catalyst for half of the reaction, while zinc is a cheaper commodity than lead. He notes, "Zinc energy storage has been around forever -- every button cell in a hearing aid uses it." But, he said, "rechargeability was the challenge," adding that the firm has "figured out the rechargeablity piece." The CEO suggested that applications needing three to four hours in duration are best for lead-acid and lithium, but "neither do well over four hours." What's more, "long-duration gets expensive quickly at $300 to $400 per kilowatt-hour. Our sweet spot is four to 24 hours, and at $200 to $300 per kilowatt-hour, we're ready to serve the long-duration market." The company has been deploying systems since 2011 in remote, weak-grid applications. 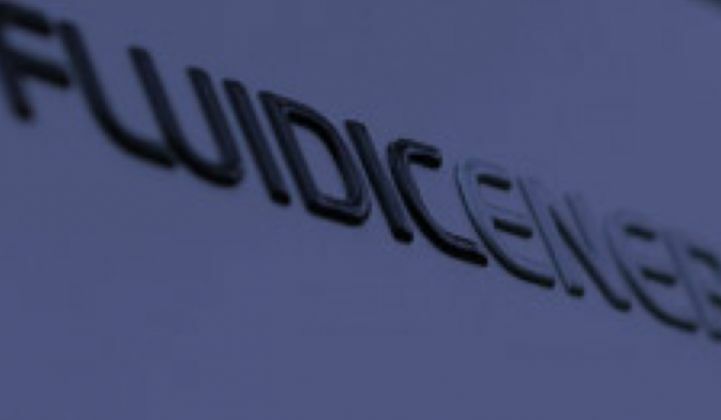 The CEO said that Fluidic was "lucky enough to find a customer willing to take some risk and switch from lead-acid." Most of the firm's recent deployments are in telecom in the 1-kilowatt to 4-kilowatt range with eight to 12 hours of backup, according to the CEO. Scharnhorst said that its large corporate footprint in Indonesia "has allowed us to refine our technology in a very unstable grid application." In a nation with grid reliability as low as 70 percent, according to the CEO, "When you put a product [on the grid] in Indonesia -- it's well tested." The CEO expects most of his near-term business to be in Southeast Asia, with a relatively smaller portion in Central America. The CEO spoke of the Indonesian project as a "good foothold" in low-voltage nanogrids that have no diesel backup. "We look at ourselves as a diesel displacement tool for over 13,000 islands." The Indonesian president wants to eliminate subsidies for diesel fuel because it's a drag on the economy, said the CEO, who cited the potential of nanogrids 100 kilowatts in size and smaller with "24- and 48-hour backup." Scharnhorst said that batteries (like diesel) are a high-theft item. He suggests that Fluidic's deep integration of electronics makes repurposing difficult and serves as a theft deterrent. The electronics also allow the company to "monitor the performance of every deployed asset we have around the globe" from its network operations center in Scottsdale, Arizona. He said the company can remotely take "a misbehaving cell offline to clean up the zinc anode and do maintenance." David Snydacker, a battery expert at Dosima Research, helps with some of the science: "Zinc-air batteries are complex devices combining characteristics of both batteries and fuel cells. The zinc-air anode is made of zinc metal and functions like a battery. Zinc metal anodes are commonly used in disposable alkaline batteries, which cannot be recharged due to growth of zinc dendrites. Dendrite growth is also a challenge for zinc-air batteries. The zinc-air cathode functions like a fuel cell; it is made of a porous layer that must deliver purified oxygen gas to react with the zinc. Fuel cells are typically limited in energy efficiency and power density because of fundamental challenges in catalyzing reactions involving oxygen gas. Zinc-air batteries face similar challenges." "In a zinc-air battery, the electrolyte is a liquid that must transport zinc between the anode and the cathode. Historically, zinc-air batteries were built with electrolytes based on water. According to a patent filed in 2012, Fluidic Energy is developing a new electrolyte based on a sulfonate ionic liquid. Ionic liquids are attractive because they limit water evaporation and hydrogen gas generation, thereby improving cycle life. However, ionic liquids also slow down charging and discharging. Many companies try to spin slow discharge by marketing “long duration," but low power is usually a drawback." Other firms developing zinc and zinc-air batteries include Eos Energy Systems, PowerGenix and ZAF Energy Systems. Fluidic's CEO said, "In the developed world, batteries are an insurance policy. In the developing world, batteries are an active part of power delivery." Fluidic Energy has raised funding from Madrone Capital (Wal-Mart's venture arm), Caterpillar, the International Finance Corporation and the U.S. Department of Energy's ARPA-E program.